Get your fix of adventure on this 6-hour tour of Ariel's Point, an eco-adventure destination that promises beautiful views and clear waters. Cliff dive, kayak, snorkel, and more on your own schedule using provided equipment. This kid-friendly tour is suitable for adventurers of all ages and abilities, from 50-foot cliff divers to laid-back beachcombers. Ariel's Point is located on the western edge of Buruanga, an unspoiled fishing village on the island of Panay. The unique location of Ariel’s Point provides guests with beautiful views of turquoise swimming holes, colorful marine life, lush tropical forests, and volcanic rock formations. The absence of modern commercial development in this area makes it the perfect place for enjoying cliff diving, kayaking, and snorkeling while admiring the natural beauty of the Philippines. Even local monkeys are occasionally seen in the surrounding treetops. 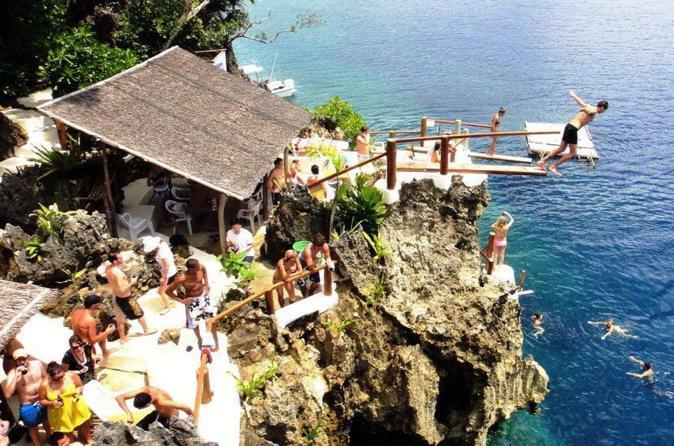 Trips depart once a day from Ariel’s House at 11:15 a.m., and return to Boracay’s White Beach at 5 p.m.
Cliff Diving: With five different diving boards and platforms ranging from as low as 9 feet (3 meters) to as high as 50 feet (15 meters), it’s no surprise that Ariel’s Point was listed in the Huffington Post as one of the world’s top cliff diving destinations. If you love new challenges, are willing to take risks, and are in suitable physical condition, Ariel’s Point is the perfect place to check cliff diving off your bucket list. Note: Ariel’s Point has a bamboo ladder and a floating dock that guests can use to enter the water without cliff diving. Kayaking: Kaya from Buruanga, a small coastal village on the island of Panay. Enjoy paddling to nearby deserted beaches or use your sit-on-top kayak as a mobile platform for cliff diving and nature photography. You might even encounter some flying fish or start a conversation with the local fishermen. Both single (one-person) and tandem (two-person) kayaks are available. Life jackets are provided and must be worn at all times. Paddle boarding: We have Stand-Up Paddleboards (SUPs) for guests to enjoy. Test your fitness and enjoy a unique perspective on the water with our brand new boards, which were custom-designed for beginners. Life jackets are provided and must be worn at all times. Boat Cruise: To reach Ariel’s Point, you will take a traditional Filipino outrigger boat known as a banca beyond the shores of Boracay and along an unspoiled coastline comprised of lush forests, deserted beaches, and volcanic rock. The boat ride, which lasts 35 to 45 minutes depending on the type of boat used, is the perfect time to make new friends while enjoying cold beverages served by our staff. Guests can sunbathe with beautiful views of the Sulu Sea. In addition to several hammocks, a floating bamboo raft is available for guests to relax on when sea conditions are suitable.